A view of the London and Greenwich Railway, Bermondsey. This watercolour is one of the earliest known images of passengers arriving at a railway station and preparing to board a train. 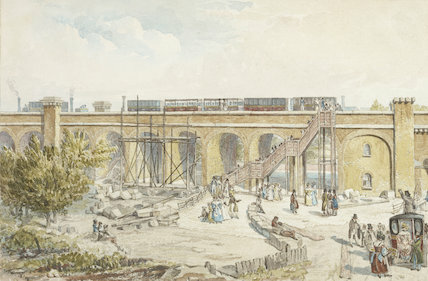 The London to Greenwich suburban railway was built over a viaduct which crossed over Bermondsey, an industrial and working class area, and then over marshland and market gardens to Deptford and Greenwich. Spa Road remained the temporary terminus for this railway until London Bridge station opened in December 1836. The topographical draughtsman Robert Blemmell Schnebbelie was active as an artist from 1803 and exhibited at the Royal Academy occasionally. In 1847 he was found dead in Camden, having died in poverty.